Padre Dam Municipal Water District built Santee Lakes to demonstrate the promise of water recycling. Santee Lakes Recreation Preserve hosts over 670,000 visitors a year. 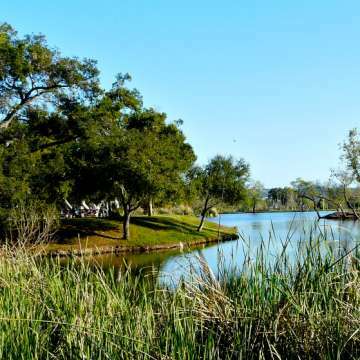 The 190‐acre Park with 7 beautiful recycled water lakes that are stocked with sport fish year-round. The Park provides amenities including camping, cabin rentals, fishing, boating, special events, playgrounds, walking trails, and approximately 230 bird species. Santee Lakes Recreation Preserve is owned and operated by Padre Dam Municipal Water District. It is self‐sustaining, receiving no funds from water/sewer ratepayers or taxpayer subsidies. The Park operates from user fees, grants and awards and collaborations with community groups and organization partnerships. Note: Santee Lakes utilizes various means to maintain the facility including the use of pesticides. All pesticides are applied by trained staff in a safe manner in accordance with the products label. Information about the pesticide products are available through the Park Office by request. Santee Lakes Recreation Preserve enhances our community through the delivery of exceptional recreation opportunities, the restoration and protection of environmental assets, and the re-investment in our Park and Campground for the benefit of people. Supporting the vision and mission of the Padre Dam Municipal Water District. Focusing on the 3 R’s: Recreation, Restoration, and Re-investment. Maintaining a safe and clean environment. Training our employees and volunteers to perform at their best. Incorporating technologies that promote best practices in our business. Practicing our core values: Trust, Integrity, Competence, Accountability, & Service. Resolving problems and issues before they become customer concerns. Working together as a team, regardless of our position, to achieve our purpose. Recognizing our teamwork and celebrating our successes. In 1927, agriculture was the primary use of land in Santee up to the 1940’s. With the construction of the El Capitan Dam, the local aquifer dried up which had supplied the farmers with more than enough water. Santee transformed from a dairy farming area to the fastest growing town in San Diego County in terms of housing development. As a result of the transformation from agricultural area to suburbia, in 1959 Santee’s most pressing water issue was not freshwater supply, but the disposal of waste water. Ray Stoyer, the General Manager of the Santee County Water District (Padre Dam MWD), had to come up with a plan, and fast. Santee had two options: The first was to join the San Diego Metropolitan System along with other towns in the county and send poorly treated sewage into the Pacific Ocean. This option would be costly and lock Santee into a 40 year contract with the San Diego Metropolitan Sewer System. The second option was to create a new treatment system that could handle Santee’s sewage while meeting the strict State discharge requirements. This was a daunting task considering treatment technology was not well developed in 1959, but Ray Stoyer knew it could be done! Through a multi-stage treatment process, the solids and dissolved substances could easily be removed producing usable water. His idea was to clean the town’s sewage and then offer it as a low-cost water supply for irrigation on golf courses, crops, home lawns, industries, highway beautification and recreational use. 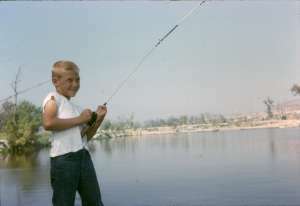 By 1961 four lakes were created and recreation was made available on Lake 4 in June 1961. The rest, we’ll say, is history!